Whole Foods felt the wrath of the Twitter-sphere this month. The episode started with consumers questioning the company’s ethical bona-fides but, in the end, cast into doubt the effectiveness of “ethical consumerism” itself. It’s another example of the unlikely lessons, recounted in my new book Freegans: Diving Into the Wealth of Food Waste in America, we can learn from looking at the cast-offs of our food system—in this case, orange peels. “OrangeGate” started when a shopper in a London Whole Foods tweeted a picture of a new product: pre-peeled, individually packaged oranges. She acerbically remarked, “If only nature would find a way to cover these oranges so we didn't need to waste so much plastic on them.” Online outrage ensued and the photo was retweeted 110,000 times. Whole Foods eventually declared that the innovation was, in fact, “a mistake” and promised that they had been “pulled” from the shelves. It was a modest win, but one worth celebrating. The problem is not so much the packaging the oranges were being sold in—plastic—as the one they were not—the peel. Stores like Whole Foods pre-cut, pre-peel, and pre-cook food in order to increase selling prices in a competitive market where the raw materials—that is, the food itself—are unprecedentedly cheap. These practices “add value” for the company, but they subtract from foods’ shelf life—contributing to the U.S.’s 50% increase in food waste per capita since the 1970s. The environmental impact of the water, fertilizer, and land area that goes into a piece of produce we don’t eat is often even worse the more visible waste of excess packaging. But environmental activists’ celebrations were cut short. Disability-rights advocates pointed out that, although certainly not the intention behind their introduction, Whole Foods’ pre-peeled oranges (and pre-cut foods in general) are a boon for people with limited hand dexterity or arthritis. That this had not been taken into consideration showed that “protesters prioritized the environment over the experiences of disabled people.” Some environmentalists conceded that these counter-critiques had a point. But this leaves those of us still following the story at an impasse. What do we as consumers do if we care both about the environment and accessibility? The problem, I argue, is the assumption behind the question itself: that we should confront social problems as individual consumers. As OrangeGate showed, ethical consumerism is a bit like Whack-A-Mole. As the one-time consumer activists I interviewed for my book realized, we often solve one problem in our lifestyle only to uncover three new ones. It’s the frustration that confronts vegans who discover that the production of vegetable crops on industrialized farms kills billions of small animals; conscientious shoppers who start buying from “natural” foods stores like Trader Joe’s or Whole Foods only to find out their promises of perfect food make them often the most wasteful; people who patronize their local farmers’ market religiously until they learn that small producers, too, can have abusive labor practices. These realizations can lead to disenchantment—or to a creative rethinking of what effective activism is all about. My book centers on one group of people who embarked as individuals on a search for ways to live both ethically and efficaciously and wound up adopting a new and poorly understood collective approach: “freeganism.” Freeganism, as one of my respondents told me, is a kind of “practicing anti-capitalism” in which participants refuse, as much as possible, to buy anything. Freeganism is founded on the idea that every product in an increasingly un-regulated market economy—even those labeled “organic,” “fair trade,” or “humane slaughter”—can be traced back to abuses of one kind or another. The practices of freeganism are, unsurprisingly, not exactly appealing to everyone (although resistance tends to soften as soon as one sees a dumpster full of one-day-expired bags of premium coffee or an entire trash bag filled with still-warm donuts). Nor is freeganism an accessible practice to a large part of the population. I outline in my book how the movement struggled to overcome barriers to participation related to class, race, and ability, as well as a pushback from stores concerned about the negative publicity (so much so that some started bleaching their garbage and guarding their dumpsters!). But the point of freeganism was never to convince everyone to jump into a dumpster. Instead, freegans use the provocation of uncovering waste—“Did a store really throw that out?”—to question the assumptions behind ethical consumption. As freegans constantly reminded me, money in a capitalist economy is fungible; even if you buy the oranges in the peel at Whole Foods, you’re still supporting a business model that produces pre-peeled oranges and sells them at double the price. Moreover, “free markets” are anything but efficient in translating consumer demands into concrete changes. The products we boycott are often still produced, but then thrown out—and the proof is in the dumpsters themselves (where those Whole Foods oranges “pulled” from the shelves—alongside the approximately 90% of new food products introduced each year which “fail”—probably wound up). But perhaps, most importantly, freegans remind us that the question “How can I make the world a better place?” should never be reduced to “What should I buy?” Freegans avoid wasting food not by buying fancier packaging, but by sharing with one another when they have too much; when they can’t find the right ingredients, they don’t rush to the store, but they cook together. As soon as we look at our food system as something we are constantly producing as a group—whether through gardening, foraging, or gleaning—some of the problems confronting us when we see ourselves only as consumers, left to manage as best we can with whatever the market makes available to us, disappear. Not being able to peel oranges, after all, is only a problem when we expect people to shop, prepare, and eat their meals alone—rather than, as freegans did, treating feeding ourselves as a collective effort in which everyone has something (literally and figuratively) to bring to the table. 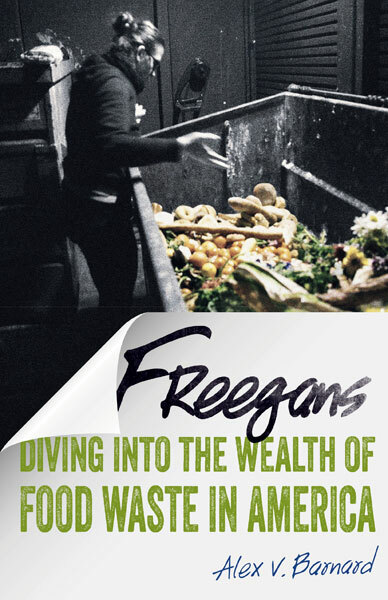 Alex V. Barnard is author of Freegans: Diving into the Wealth of Food Waste in America. He is a doctoral candidate in sociology at the University of California, Berkeley, and a food justice activist.